Oswald is a pardoner serving Velka, Goddess of Sin. He can absolve the player's sin for a cost. 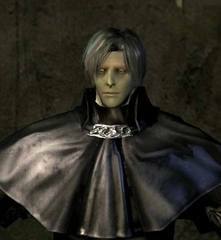 He reveals himself to the player after the defeat of the Belfry Gargoyles and the ringing of the Bell of Awakening in the Undead Parish, on the bottom floor of the bell tower. Oswald reveals little of himself and other characters never mention him. He is aware of the existence of Petrus and his treachery, but it is not clear how he knows of this, but him being a pardoner might have something to do with it. Oswald's equipment gives more detail about his occupation. The pardoners listen to the confessions of sinners, urging reflection and salvation. Their masks symbolize separation from worldly desires. The pardoners' attire is uniformly black in color and said to be imbued with Velka's mystical power, which provides resistance against all manner of magic. 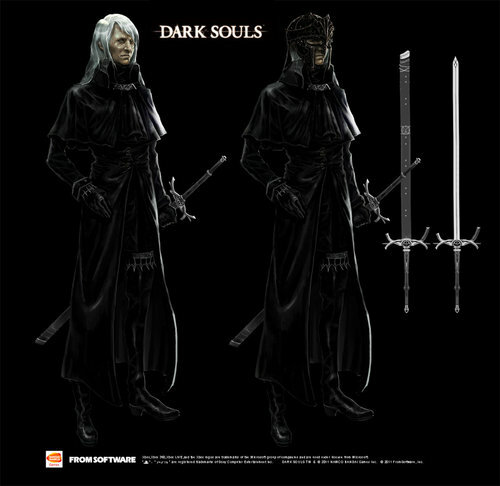 Velka's Rapier is no mere symbol to be sure; the pardoner is an inhuman swordsman, and wields this enchanted blade with a special technique. Oswald's cut dialogue suggests that hollowing, restoring humanity, sin and absolution might have been once connected. If thou desirest to preserve thy humanity, then confess thine misdoings to me. Be it granting absolution or doning penance, all sin is my domain. Greetings. Just in time, art thee not? Thou art safe now. Quickly, tell me thine confession and restore thine humanity. But do not fear. I shall free thee from thine monstrous form. When thou art in need of humanity, thou shalt be welcome. I always have an ear for confession. Greetings. I am Oswald of Carim, the pardoner. Thou art a friend. For thee, a warm welcome. Cometh thou to confess? Or to accuse? For indeed all sin is my domain. Thou appearest to lack faith, yet magnanimous are the Gods. Cometh thou to confess? Or to accuse? For indeed all sin is my domain. Good tidings, thou art welcome. Laudable is thy dedication to sin. Hmm… Hast thou acquittance with Petrus of Thorolund? I wager you two hath likely found much in common. Mask of Velka Mask worn by pardoners serving Velka, the Goddess of Sin. The pardoners listen to the confessions of sinners, urging reflection and salvation. Their masks symbolize separation from worldly desires. 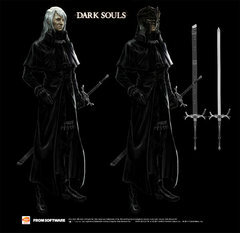 Black Set The pardoners' attire is uniformly black in color and said to be imbued with Velka's mystical power, which provides resistance against all manner of magic. Velka's Rapier A symbolic, powerful thrusting sword used by the pardoner serving Velka, Goddess of sin. It is no mere symbol to be sure; the pardoner is an inhuman swordsman, and wields this enchanted blade with special sword technique.